From the Hancock County Courthouse, go southwest on Hwy 22 for 7.3 miles to Pearson Chapel Road on the left. Go about 1.4 miles on Pearson Chapel Road. Take the road / driveway on the left just before getting to the big power transmission lines. Gain permission and go through the gate which is locked. Follow the road along the power line easement, and bare right off of the power line easement at the top of the next hill. The cemetery is located in the woods where the road forks to the left -- the cemetery is in the center of the fork. The cemetery is 0.5 mile from Pearson Chapel road. 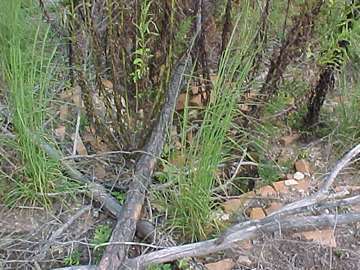 A brick wall about one foot high used to surround this cemetery but was destroyed by recent logging. d. after 1853 since last child born then. All info per Carolyn Waddell Stembridge. Age 63. Dates unknown. All info per Carolyn Waddell Stembridge. b. N.C. m. Nancy Garland. Drew a land lot and established the homeplace here. So probably is buried here per Carolyn Waddell Stembridge. All info per C. W. Stembridge. w/o William A. Stanton. Probably buried here. All info per Carolyn Waddell Stembridge. Possibly another 3-5 graves in this area.